Batman & Robin, Laverne & Shirley, Peanut Butter & Jam, Peanut Butter & Chocolate, Peanut Butter & anything, really … these are all dynamic duos. Whether fighting crime, getting into crazy hi-jinx, or tasting truly awesome, these duos are more together than the sum of their parts. Very Gestalt. Sometimes in life, we make just such a great pairing. Such is the case for Operation Green and a nifty NGO called Not Just Tourists. 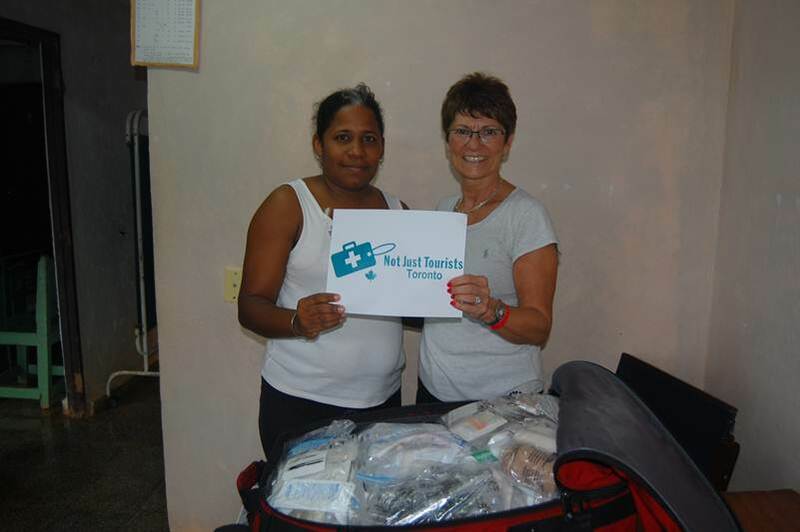 Operation Green supplies reach Cuba thanks to Margo from our own PMH Foundation! She carried a suitcase for Not Just Tourists. Let’s start with Operation Green, a little group run by volunteer med students doing their training at UHN. As we mentioned in the Great Case for Babies and Bathwater, Operation Green salvages super useful stuff from our operating room waste … nothing nasty, just nice & clean “surgical overage”. These are supplies readied for surgery but never used, then later discarded to landfill, or worse…the incinerator. What a waste. Not only does Operation Green keep these valuable supplies out of landfill, they get them shipped to developing countries that really really need them. Now these communities have access to clean gloves, bandages, needles & portable x-rays (could be last-year’s model, but still good) and we save the hauling fee by not sending these to waste. 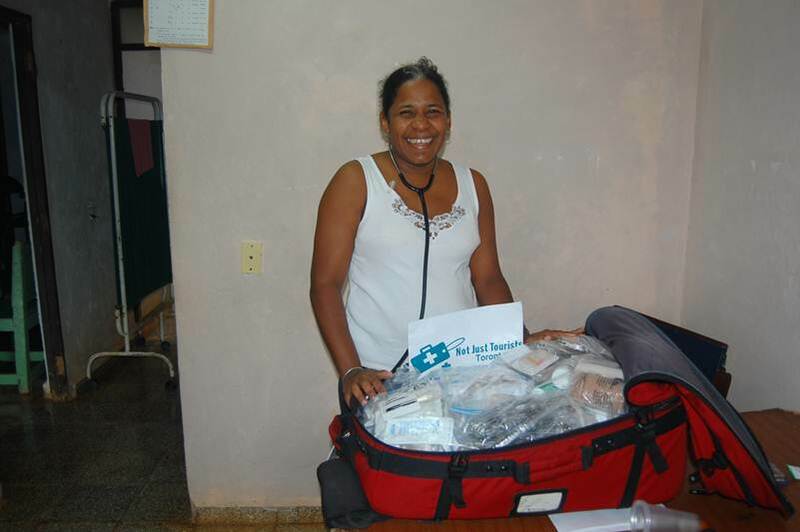 This nurse runs the only nearby health Consultario in Chorro de Maita, Cuba. She loves her new stethoscope and med supplies via Operation Green & Not Just Tourists. Operation Green collects the supplies, but always needs a place to send them and a way to get it there. That’s where groups like Not Just Tourists come in. They have centres across Canada and we linked up with Avi in the Toronto chapter. They have a pretty simple mandate: send a suitcase of med supplies with someone already traveling to a country in need. Whether they’re going for business or pleasure, it makes their trip so much more meaningful … and that is always a pleasure. 176 lbs of Blood testing supplies went from Toronto to South Africa to test for HIV. 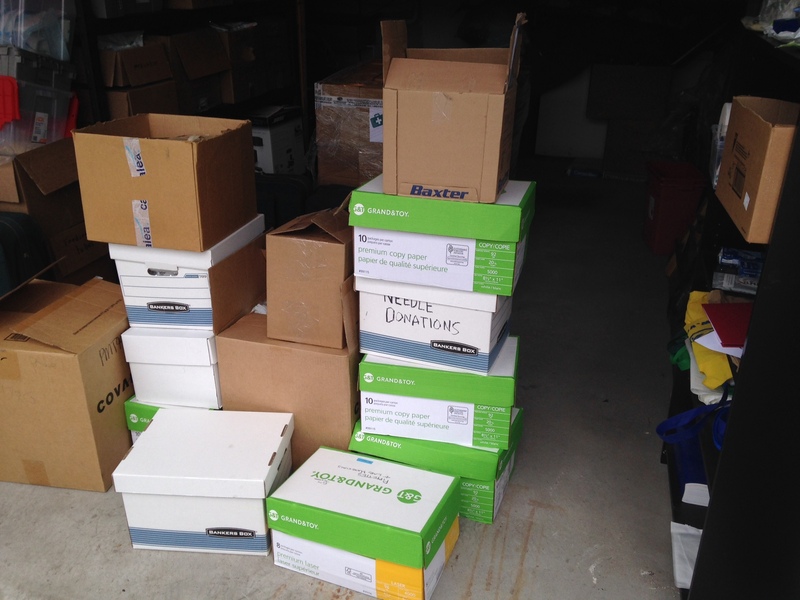 These boxes are full of 176 lbs of blood testing supplies: collection needles, vacutainers, alcohol swabs, pipettes, flushes. Thanks to the dynamic duo, this made it to a clinic in South Africa for HIV testing. If you work at UHN and have any surplus medical supplies, contact OperationGreen@uhn.ca. If you work in a hospital, see if you have an Operation Green Chapter (and start one if you don’t). And if you’re heading anywhere interesting in the world, you may want to carry a suitcase too. An extra suitcase can save a life. Kyle shows us how simple it is with his journey from Toronto to Calcutta, Mother Teresa House. This entry was posted in Beyond Talkin' Trash and tagged medical supplies, Not Just Tourists, Operation Green, reuse. Bookmark the permalink.